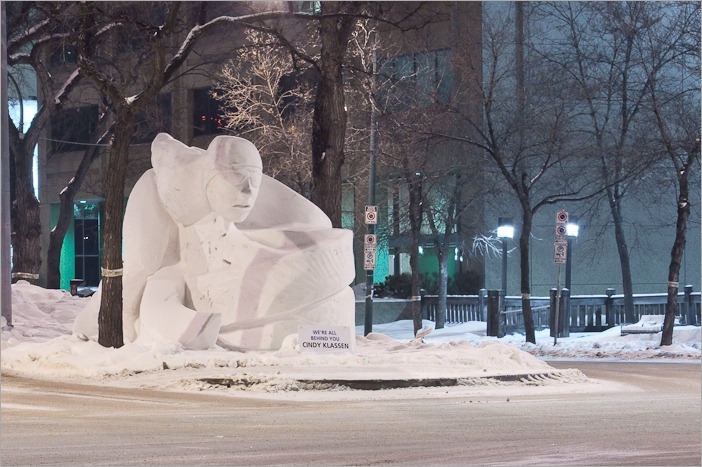 Winnipeg is a cold (-hearted) city? Winnipeg is a beautiful place to live, I love it. And really not as crowded as many other cities with the same number of inhabitants. Of course that also may be a result of past… let’s say “miscalculations”. 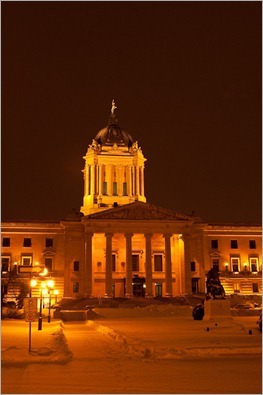 When in the late 19th century Winnipeg was growing and growing, the general consensus was that Winnipeg was going to be the central hub for North America. Railways were planned, Union Station was big and powerful. Many government buildings were built with the future in mind, meaning “on the big side”. Roads, streets and avenues were large and comfortable enough to accommodate lots of traffic. Then came August 15, 1914. The BLOW to Winnipeg’s future was given by the opening of the Panama Canal. Within a few weeks it was clear that Winnipeg would never become the big city that it had been designed for. Instead of 5 million people estimated, the number of inhabitants is now about 700,000. The better part of it is that rush hour only lasts 20 minutes. From a photographic point of view there is a lot of interesting things from this glorious (to be) past. 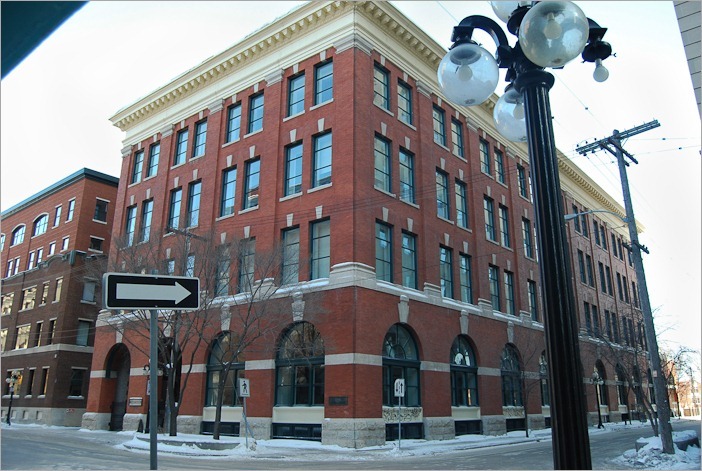 The Exchange district is full of old and interesting architecture, there are sky scrapers, although the sky in the beginning of the 20th century must have been a lot lower than today’s. An interesting “side effect” from staying a smaller city is that activities are blooming. Economical activities as well as cultural activities. Take the Festival du Voyageur or the Folklorama for example. Yesterday started the 41st Festival. The Folklorama is held in August. Lots of other activities are here to enjoy and to take pictures of. When you get to these sculptures in the evening, there are interesting views to be taken. Although the sodium street lamps give a fierce colorcast to your pictures, a bit of post processing can get rid of that. The Legislature or Legislative Building, built in 1919, with its Golden Boy on the top gives an interesting view when simply photographed by night. However if you remove the colorcast of the sodium lamps, a much more interesting view is presented. 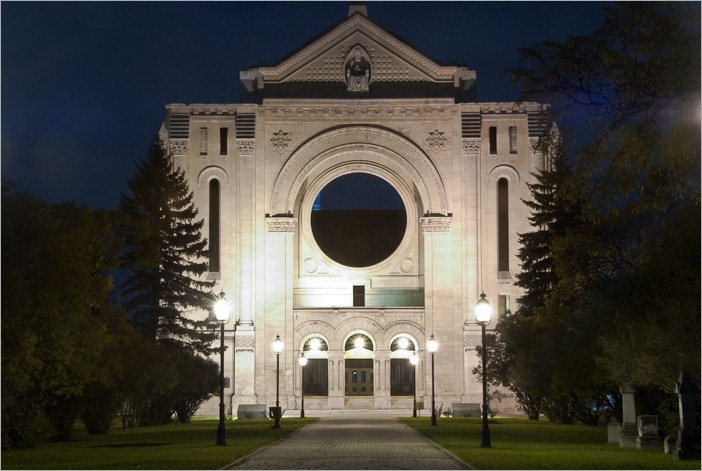 The same kind of picture can be had of St Boniface Cathedral, well, what’s left of the previous version. 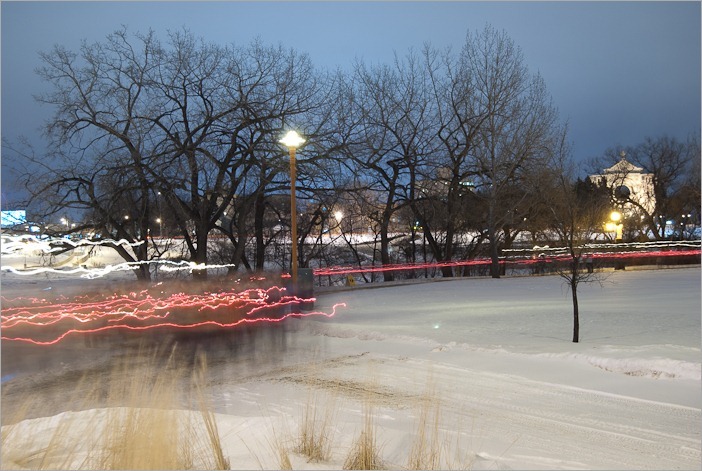 The Festival du Voyageur starts with a torch light walk over the Assiniboine River, over the Provencher Bridge to the Festival Park, also known as Whittier Park where stands Fort Gibraltar. The torches cast an eerie glow over the tracks. Exactly what the early settlers must have seen when they arrived here at the confluence of the Assiniboine river and the Red river. 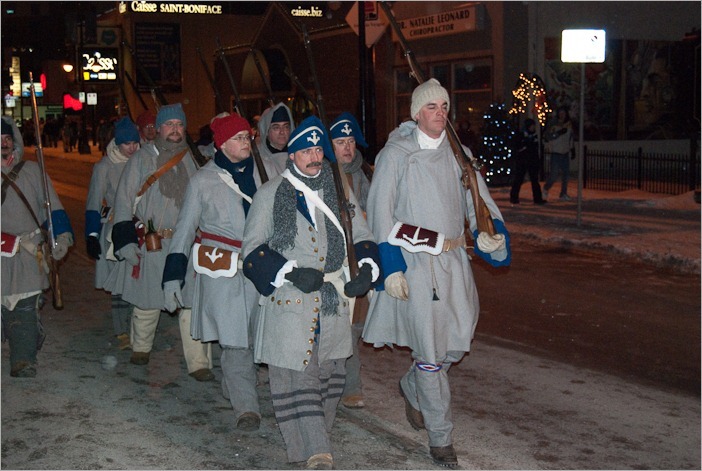 The Festival starts with many activities on Provencher Boulevard, even the old guards are there to protect (ehm… who? us? the fort? the festival?). Anyway they look as if they are in the original outfit of the guards of the fort and look serious if not dangerous. I believe they would be dangerous to themselves if they tried to fire one of these old muskets. 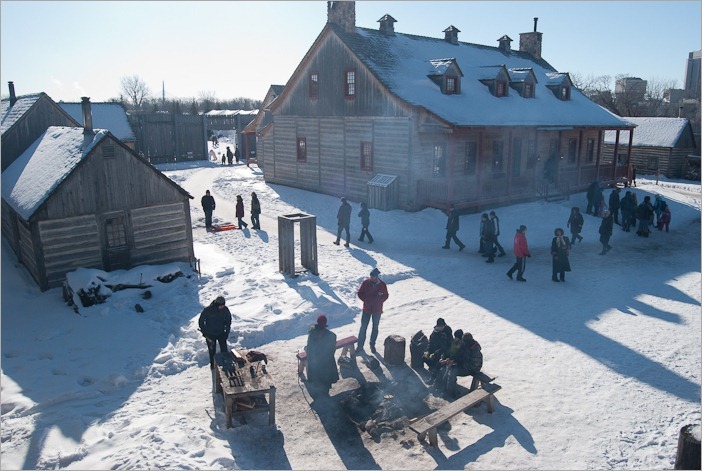 The Festival du Voyageur is mostly held within the limits of Fort Gibraltar. Fort Gibraltar is a reconstruction of an old fort and trading post as they could be seen in the 19th century. It contains different activity-specific buildings. For example there is the Trading Post, the Blacksmith and of course the General Store. It looks a bit like in the old western movies, but still there is a typical Canadian touch here. Here, by a temperature of –15C people are outside, grilling sausages and inside enjoying presentations of old and past craftsmanship. Also the contest for the best snow sculpture of the year (at least of the festival) is held just outside the gates of the fort. Click here to subscribe to the NewsFeed of this blog and don’t miss the next post!